We would like to welcome you to Moondance Resort. 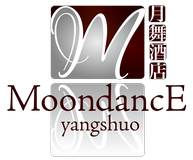 Situated a comfortable eight kilometers outside famous Yangshuo, right along the Jinbao River and with stunning views of the surrounding Karst mountains, Moondance captures all the needs a traveler could wish for. The serenity and tranquillity of the Guangxi countryside combined with all modern day comforts and amenities in and around the hotel will turn your stay into a true paradise-like experience. Explore the quiet backroads on bicylce; hike the lush buffalo trails on foot; plunge into our natural swimming pool to cool down; enjoy the tastiest self-grown vegetables in our cozy restaurant and let your muscles relax during a well deserved traditional Chinese massage.